It’s back to school this week, and for one group of young children in Hampshire the experience will be quite different from the start of term in September 2012. 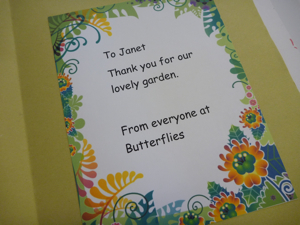 Last winter, after seeing a cry for help in a local newspaper, I got involved with the aptly named Butterflies Pre-School Playgroup designing and creating a wildlife garden on a patch of very uninspiring ground outside the Village Hall in Four Marks, Hampshire, where they are based. There was no money in the budget AT ALL so the project was very much a question of coming up with a simple plan and then working out how to get the garden built for, well, nothing! 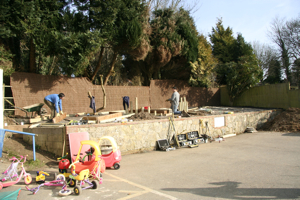 The new garden would have two main purposes, the first one being to create a space for the children to spend time outside without having to play in a cordoned-off section of the car park, as they had been doing. 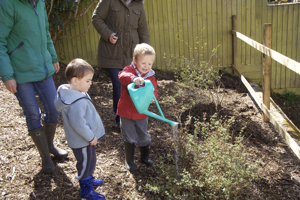 And the other main aim was to develop a garden where the children can learn how plants grow, and in time enjoy watching birds and insects which will be attracted to the garden. 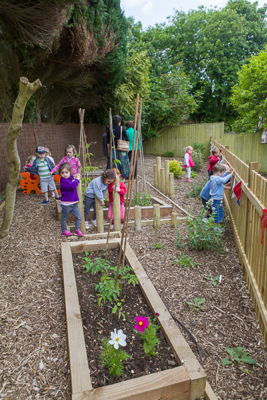 Sarah, who owns the school, had a wishlist of various elements she wanted in the garden – including a giant insect hotel, and a ‘bird’s nest’ to create a semi-enclosed space for the children to sit outside. 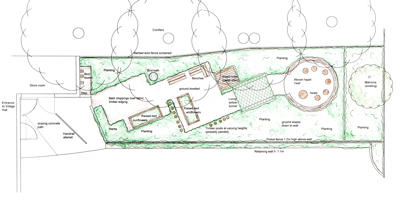 With this in mind, my design plan included borders around the perimeter for shrubs and perennial plants which would be easy to look after (a very important consideration! ), and which would attract pollinating insects, and birds. I also included a couple of raised beds for growing annual flowers and simple fruit & veg (strawberries and beans), the giant insect hotel (to be made from stacked pallets), spaces to hang bird feeders and to add a bird bath. The path through the garden leads to a circular seating area (using cut down tree trunks as seats), and this will ideally be enclosed by means of a woven hazel fence. I also added a series of upright wooden poles to partially divide off the garden but also for the children to enjoy scrambling over. The layout is designed on the diagonal to get the most out of the long thin plot. Although a curving design would have been nice, straight lines are always easier and generally cheaper to construct, and as there was no budget for this project, the design had to be kept as simple as possible. We were very conscious of safety (with the garden being on a raised bank with a dangerous drop) so fencing had to be added above the retaining wall. But rather than a solid fence I suggested the use of a picket fence which would keep the area and the children secure, but would let light through and give a more open feel to the space. The surface of the garden paths and non-planted areas is bark chippings (over a membrane underneath to keep weeds from coming through). There are large conifers overhanging some of the space, but it does get sun for half of the day which is ideal as there’s shade for the children in the morning if the weather is hot, but there’s enough light for a lot of plants to grow. Having said that, the soil is a horrible mix of clay and stones so it’s not the best! It would be nice to also take up one of Sarah’s ideas which is to have a woven willow tunnel, but the site conditions aren’t ideal, so we’ll have to see how that develops. With budget and time constraints, our plan was to work on the bones of the garden this year, and then over time add in all the extra elements which will finish the space off and make it a lovely garden for the children (and adults) to enjoy spending time in. So, then it was a case of finding kind people to help! The ground was full of roots and tree stumps so my first call was Peter Wright of StumpBusters Hants, who spent hours grinding down the stumps very efficiently. I managed to persuade a landscape contractor I work with (Doug Hammond of Hammond Landscapes in Godalming), to put the hard landscaping in place. He very kindly gave up 4 days of his (and his workforce’s) time. (All the materials were donated by local businesses including Flair Woodwork who provided all the timber). The fencing was donated and erected by one of the parents (SNB Woodworx), and finally it was time to start planting. It would be nice to say that all the plants are in place and it looks perfect, but that’s not the case – yet. I was given some shrubs by a local tree & shrub wholesale nursery who I use a lot (Griffin Nurseries in Milland), and local plantswoman Marina Christopher who runs Phoenix Perennials, a perennial nursery virtually on the doorstep (how fortuitous!) generously donated a lot of insect-friendly perennials and annuals. The children helped with the planting (or at least the watering – of both plants and me), and a good time was had by all. The ‘Grand Opening’ took place in June and I was honoured to cut the ribbon and declare the garden officially open!! We even had the local press on hand in the shape of the Four Marks News. 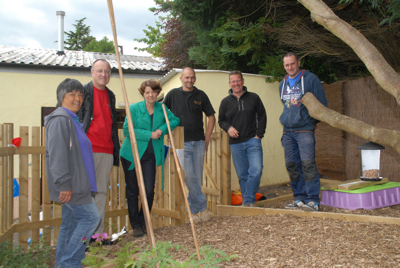 The very kind people who donated their time to build and plant the garden – and me! But there’s still more to be done. With a project like this where time is limited, and summer holidays are long, there was no point filling the space with plants which would need a lot of looking after when there was no-one there to do it. We have covered the borders in (donated!) 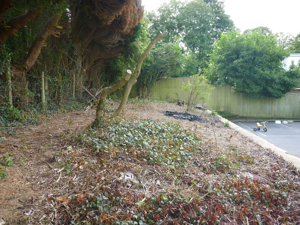 bark chippings for the time being to keep the weeds at bay, and will gradually move it back as more planting is done. So the work will continue this winter, and probably even longer, but at least in the meantime the children at Butterflies have a space to explore and enjoy, and somewhere safe to spend time outside in the fresh air. If you’d like to find out more about creating a wildlife garden, check out my earlier blog 6 steps to creating a wildlife garden. Brilliant Janet! ……. hope this inspires others as I reckon there’s loads of “wasted space” out there ideal for children to play and learn in and enjoy themselves. Thanks Mike, I completely agree with you. There’s no denying that it takes a bit of effort and a lot of goodwill to get these sort of projects to work, but it’s really worth it. What a fantastic project with such kind people helping and donating time, plants and materials. I bet this was more fulfilling than some of the projects that you have been paid to do! 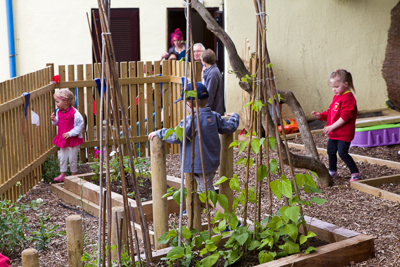 I am hoping to create a tiny space at our local primary school, with no budget and a hard area to design. You have given me hope and inspiration! I guess we were lucky that people were so generous, but if you don’t ask, you don’t get! Good luck with the project Lysanne.